why is "Spontaneous" Still not Ready? anyways, that's the main excu... er, reason the book isn't done yet. but i'll definitely finish it soon, so stay tuned. also, you can still preorder this 80+ page labour of love via paypal (or by sending a money order) for just $35. 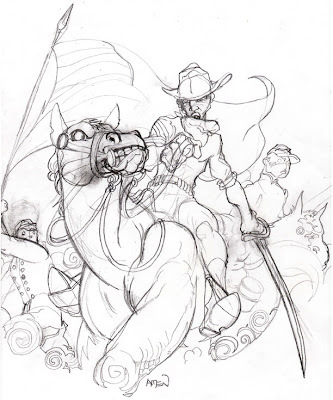 i'll post the final joint when it's done, but this is the best progress i've made toward a final illustration. the Urban Arts Festival was a big success! thanks again to the fam at ArtLoveMagic.com for makin' it blend, and props to each and every art afficianado in attendance! 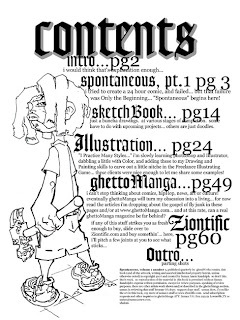 instead of showing the cover here, i'm showing the table of contents, so you can know just what to expect... but basicly, it's 90% of the sketches/illustrations/designs from my blogs/websites and many never seen anywhere, homie!